Do you sometimes look at the latest project on Pinterest or a crafty blog post for young children and feel inadequate or even stressed out? Hands up at this end and I’d argue it’s not because I’m having a helicopter mommy moment. Crikey look how clean and tidy everything looks? How much would it cost to buy all those bits and bobs? (Budget line items are an issue at our house. Have you noticed how EVERY purchase seems to add up so quickly – even at the dollar store?) Here in Greater Vancouver we’re coping with 84% of our pre-tax household income going towards living expenses. Or a percentage not far removed – depending on where you live. Contrast these “I’m not sure I can devise and keep all those crafts going” concerns with the exciting discovery that science and technology museums are sharing projects and videos online that you can follow remotely from your home wherever you are. Now THIS is something I can get my head around. The Museum of Science and Industry in Chicago has run summer programmes that include videos, PDF files and online instructions to help children (and their adult helpers) try out scientific projects. The material required can usually be found either lying about the house or can be sourced out from a friend or relative’s house. Our first project was a balloon racer. We printed out the template for what we called “the Skytrain” and coloured it in. Make sure you set your printer to print landscape before you hit “print”. If you don’t have easy access to a printer, don’t worry. 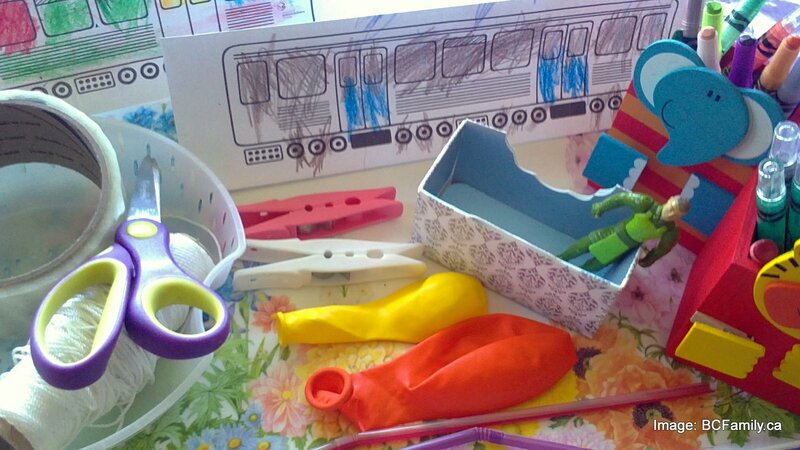 You could draw out your own train based on the photographs shown here. 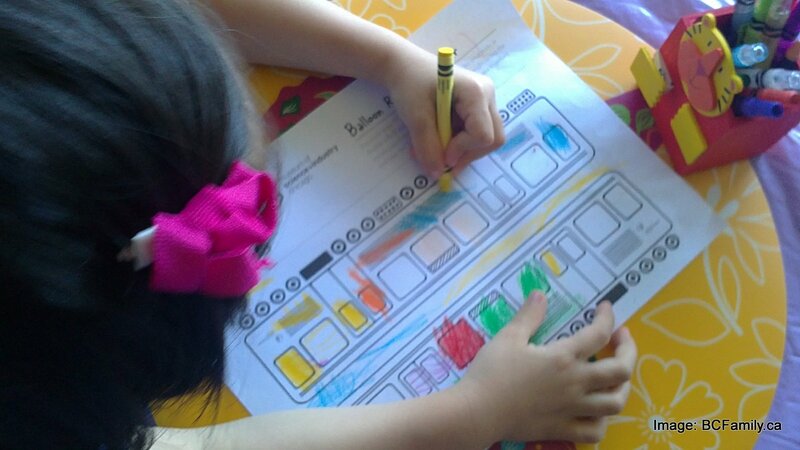 The train we coloured in was printed on 8 1/2 x 11″ paper. 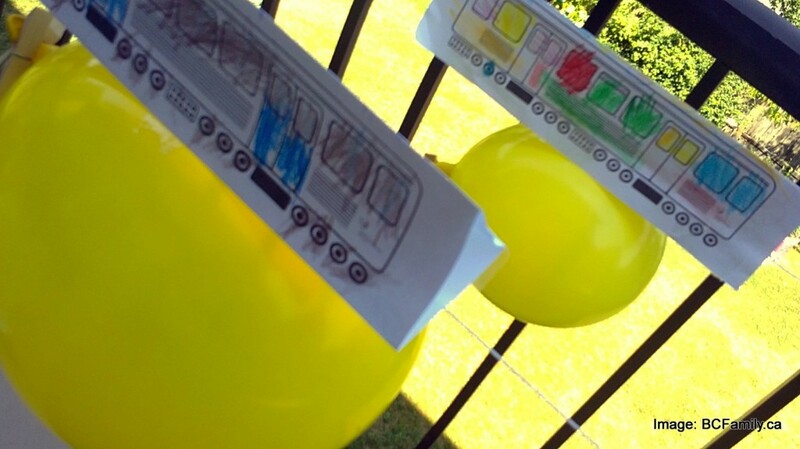 The tops of each side of the train touch each other in the middle of the paper. Here the Skytrains are finished and taped together into a triangular shape. Think of the shape of a Toblerone chocolate bar. A straw is taped under the bottom of the train so that a string can be run through it. 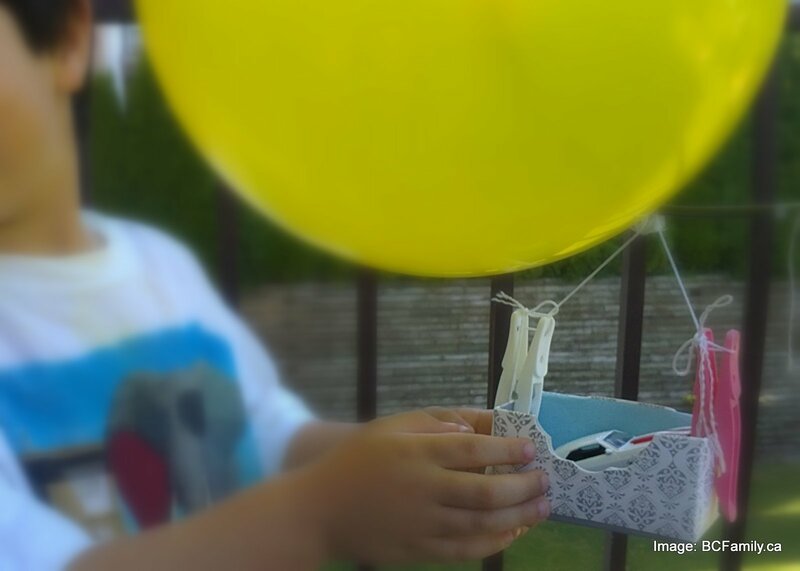 We collected a small box and items to go in it that could be mounted underneath our balloon racers. We used packing tape rather than regular scotch tape. 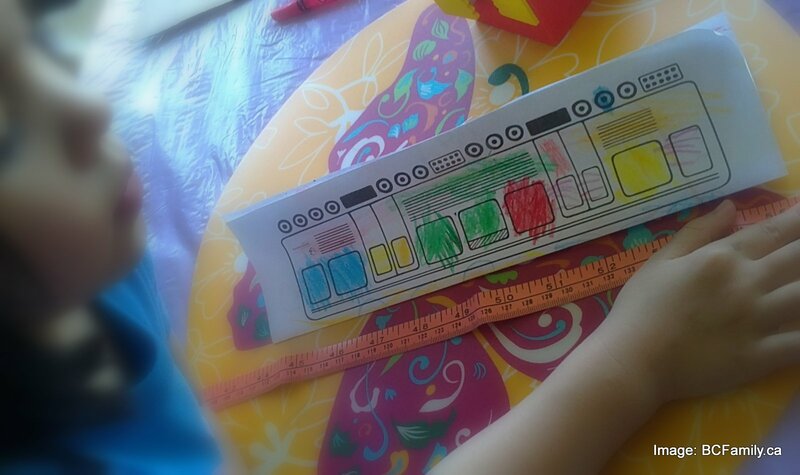 Our junior scientist decided that she needed to measure the train before it was mounted. We decided to mount our balloon racer string between two sides of our balcony. By the way, this isn’t strictly a summer project. It would work on any dry day if you want to go outside. Or you could find a way to attach the string inside your home and you will have a fun rainy day project. This experiment was a great opportunity to get out the measuring tape and go at it. 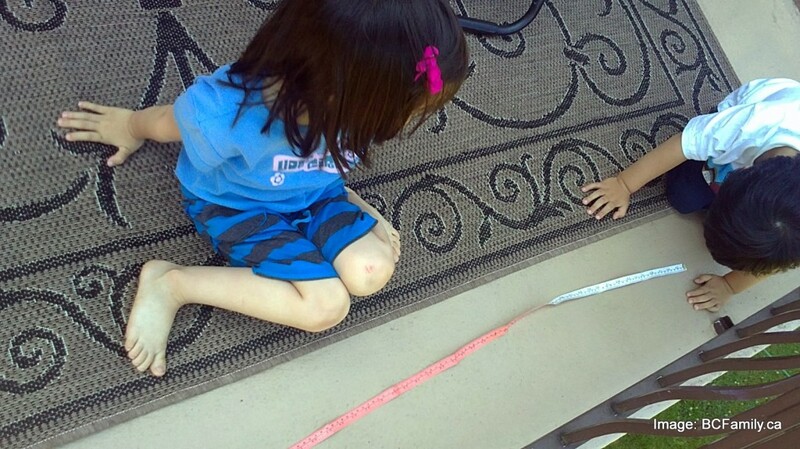 At some point you can give pointers about how the tape measure works; however, as much as possible let the child explore and make his/her own discoveries and conclusions about the information on the tape. Complete sidebar – do you see the W sitting posture in the photograph above? We found out last summer that this is a big “no no” for children. If your child gravitates towards this position encourage him/her to put feet under the bottom or sit cross legged. The Skytrains have been mounted by running the string through the straw that is taped underneath the train. The balloon is attached to the base of the train as well. The balloon should move freely along the string – ready to be sent on its way. When you blow up the balloon, clip the opening closed with a bull clip. Once the racers are ready to go, unclip the end of the balloon and let it rip! We had two lines going so that we could race one balloon against the other. We also wanted to try different ideas with different balloons. 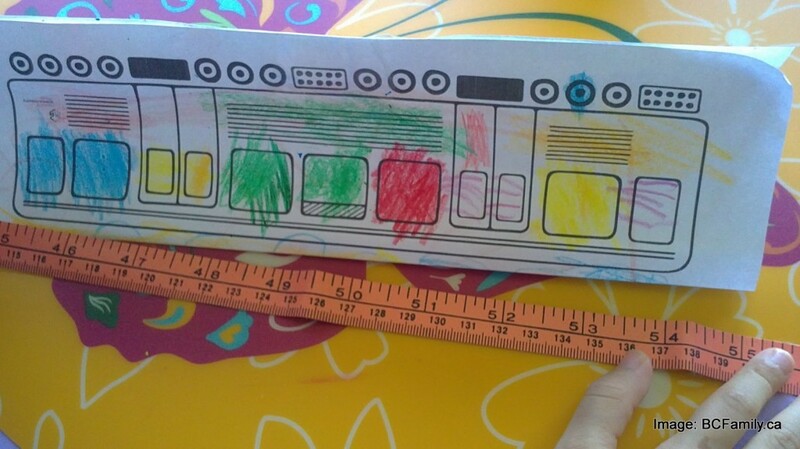 Even if you have one child working on the project, it could be useful to have a second line set up. As the air escapes from the balloon, the balloon moves forward along the string. In the video below the museum employees explain the science behind the movement of the balloon. Once we had tried this a few times we tested what would happen if objects of different weights and sizes were mounted below the balloon. We left the string up so that the children could go back and try their experimenting over and over. Make sure you have extra balloons on hand as they do break after repeated trials. As your child is using the racer you will have many opportunities to encourage conversation and consideration about what is happening and why.